Art-Deco hotel features 42 rooms with LCD TVs. Guests can dine at Hot Tuna Asian Fusion restaurant. This hotel offers 88 ultra-contemporary guestrooms, wireless Internet access, a spa, pool, and fitness center. Built in the early 1900s, the inn features four cottages and a pool in a tropical garden. With views of Biscayne Bay and the Miami skyline, this hotel offers access to restaurants and shops via the Metro Mover. Formerly Tempo Miami, this boutique hotel has 56 ultra-plush rooms and suites. This hotel is located in the Waterford Corporate Park and offers complimentary breakfast, a daily newspaper and a pool. This hotel is ideal for business travelers with its location, 5000 sq. feet of meeting space and complimentary wireless. Located near the airport this hotel has an outdoor pool, a health club and business center. 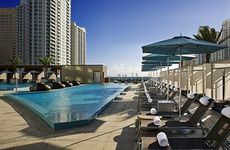 Hotel located close to Miami Int'l Airport and University of Miami featuring free wireless internet and an outdoor pool. This extended-stay hotel offers fully furnished luxury studios and one- and two-bedroom suites with private balconies. This hotel near Doral is just minutes away from Miami International Airport and Dolphin Stadium. This hotel offers complimentary 24-hour airport hotel shuttle service and is only 15 minutes from Port of Miami. This hotel just one half mile from Miami International Airport offers complimentary cooked-to-order breakfast daily. This 302-room hotel along the southeastern edge of the Florida Everglades offers guests 24-hour gaming. This hotel, with soundproof rooms, is located inside the airport terminal at Concourse E.